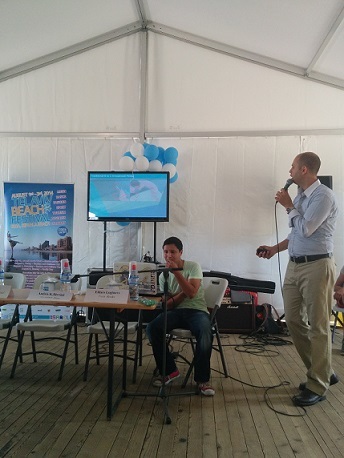 The sunny and hot day of August 1st accommodated many startup eco-system friends to come over to festival �Tel Aviv Beach� where TechHub Riga with Israel Embassy hosted an event on startups, entrepreneurship and Israel�s experience. With VC's Moshe Sarfaty keynote, startuper's Eldars Loginovs (Fastr Books) presentation and panel discussion on 'lessons learned' highlighting the event, it was clear � Latvia is at the beginning of its journey to become great and successful startup centre and we are responsible for our future decisions. The Business tent was all ready for the talks, when Moshe Sarfaty, Krypton Venture Capital Co-founder and Fund Manager and Startupbootcamp Israel mentor, began the event. He stated that the world had changed since 2000s and today�s investors expected new-wave startup thinkers to come in, those who were smarter and better prepared than ever before. Ice breaker. If you open a startup, make sure that wherever you go you are remembered and whoever you meet draws instant connections to what you do. Know your friend. You do not stand aside the startup eco-system. You are not a lone runner. You are among thousands, if not more, who live in the same environment as you do. Meet them. Dream days are over. The words �I have a dream to make money� are irrelevant today. Your main focus is on how you are going to make money. The revenue model, cash flows and market strategies are what make the past dreams into a vivid reality. McDonald�s or startup. There are different business models. There are also different business ideas. Before you decide to have a startup, figure out what you really want to do. Know your enemy and learn from him. Just like you are not alone in your eco-system, you are not the only one who does your thing in the same or similar manner. Competition in business is always present � know who you come up against, analyze them and improve your business along the way. No waster time. Everything takes away your minutes. Yet, technology enables business management to run faster, saving time, at no cost. Just a simple a Google search can show you your competitors and friends, revenue models that work and ice breakers that excite the world. No waster time means using your time more effectively! Industry knowledge matters. The more you live in the industry, the more educated you become. Dig deep and learn as much as possible � find the community that lets you do that. Respect achievement, not status. Cultural model that celebrates status is not productive. Israel, thriving from achievement, therefore celebrates what you do rather than who you are or where you come from. Your ability and experience build your success and likewise makes the surrounding community be a lot more productive and creative. Focus on a market you understand. Learn what your primary market is, what it does and how it walks and talks. If that�s the USA, measure the USA, if that�s women, measure women. Such term as global can keep you off the track. Talent is the one and only resource. It is all about the people behind the scenes � the team. Find the best talent to employ, make him/ her love what you do and your investment will return in double. In the end, there was a panel discussion, moderated by Andris K. Berzins (Chairman of TechHub Riga), that included Edmunds Valantis (Ministry of Economics), Klavs Vasks (Latvian Guarantee Agency), Moshe Sarfaty and Eldars Loginovs. They discussed what Latvia could learn from Israel to improve the startup field and how Latvia could reproduce the link which united Israel and the USA. Technological and informative support. In order to succeed Latvia needs the support by both the government and eco-system itself. While the government ensures financial tools that let startups develop and participates in promoting startup entrepreneurship, the eco-system has to provide enough space, may they are incubators, hubs or clubs, where to put these startups. The bigger is the support from either side, the wider the movement spreads. Connection value. All agree that the connections matter. If the aggressiveness of the Israel startups� promotion in the USA increases Israeli tech popularity and quality, Latvia can also drop modesty and grow the visibility of Latvian startups and their added value. Thus, the Latvians not only get on-spot representation, knowledge who is who and contact base, but create a body that constantly serves as a joining point between Latvia and the USA. The final remark closed the discussion and the whole event on a promising note � Latvia is just at the beginning of its journey towards a sustainable and great startup eco-system, and that is the most beautiful part of it. The correct push can give the best possible future. Let�s hope we do it right! 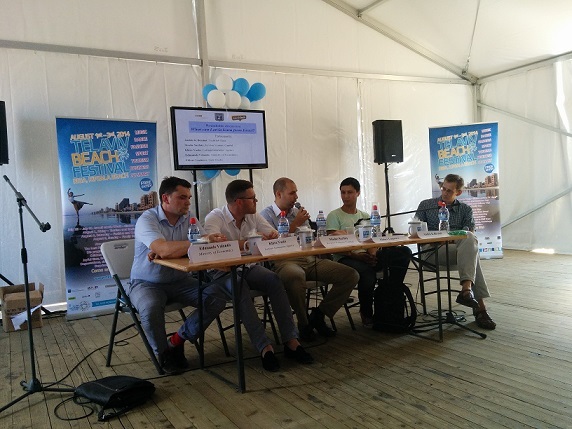 The event was a part of the festival �Tel Aviv Beach� in Riga, 2014, and was made possible thanks to our partners from Israel Embassy, Latvian Guarantee Agency and Ministry of Economics.